Interstate 205 is generally a six-lane, divided freeway that bypasses Portland by way of Oregon City and Portland International Airport. 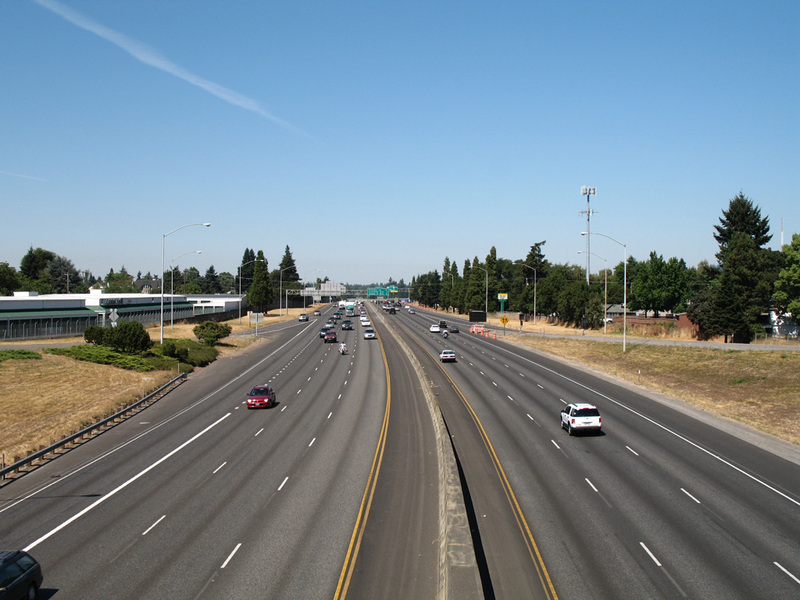 The rights of way for Interstate 205 are wide enough to allow for future expansion. Photo taken 08/27/06. Interstate 205 is the eastern bypass of the Portland metropolitan area. The mileage-based exit numbering system continues from Oregon north into Washington. Fully opened in 1983 with the opening of the Glenn Jackson Bridge over the Columbia River, the first section of Interstate 205 to begin construction was the bridge over the Willamette River in West Linn, in 1968. To avoid the Interstate Bridge north of downtown Portland on Interstate 5, Interstate 205 is a recommended alternate route for through traffic. 1974-1978: controversy erupts over Multnomah County segment, with protests made to the Environmental Quality Commission. A compromise crafted by Glenn L. Jackson (Oregon Transportation Commission Chair) was reached between the various parties involved: community groups, environmentalists, and governmental agencies. By 1978, Interstate 205 construction was allowed to continue after a nearly five-year hiatus. December 1982: Glenn L. Jackson Bridge over the Columbia River opened, thus completing the Oregon section of Interstate 205. This bridge was featured on the cover of that year’s Oregon Official State Map. Interstate 205 was the last spur or bypass Interstate route to be constructed in Oregon. Exit 36 represents the final departure point from Interstate 205 north ahead of the merge with I-5. N.E. 134th Street connects the freeway with Washington State University at Vancouver. Photo taken by Chris Elbert (05/28/05). An end I-205 shield stands at the wye interchange with Interstate 5 northbound. Photo taken by Chris Elbert (05/28/05). Southbound Interstate 5 at Exit 9 for N.E. 179th Street near Ridgefield. I-205 splits with the freeway next in 1.5 miles. Photo taken by Chris Elbert (11/26/05). Interstate 205 provides a bypass of Downtown Portland for points east along I-84. A scenic freeway, I-84 straddles the south banks of the Columbia River east to The Dalles. Photo taken by Chris Elbert (11/26/05). Exit 7 separates from I-5 south for I-205 to Washington State University at Vancouver, Portland International Airport (PDX) and I-5 south of Portland to Salem, Oregon. Photo taken by Chris Elbert (11/26/05). Southbound Interstate 205 approaches I-5 south to Salem and north to Portland, two miles. Photo taken by Chris Elbert (04/24/05). The Interstate 5 interchange is another mile south of this point on southbound Interstate 205. Photo taken by Chris Elbert (04/30/05). The mainline defaults I-205 south onto Interstate 5 toward Salem while a third lane opens for I-5 northbound to Tigard and Portland. Photo taken by Chris Elbert (04/24/05). Interstate 205 concludes as traffic separates for I-5 north back toward Portland and south to Salem, Eugene and Medford. Photo taken by Chris Elbert (04/30/05). Exit 286 leaves I-5 north to Stafford and North Wilsonville. The ensuing interchange connects with Interstate 205 northbound. Photo taken 08/27/06. This diagrammatic signage displays the Portland Interstate network prior to the split of Interstate 205 from I-5 north. Similar signs are posted at the split of I-95/295 north to Petersburg and south to Richmond in Virginia. Photo taken 08/27/06. Interstate 205 approach signage on Interstate 5 northbound. Photo taken 08/27/06. Interstate 5 northbound at the tri-level stack interchange (Exit 288) with Interstate 205. Photo taken 08/27/06. 1.5 miles ahead of Exit 288 for I-205 north on Interstate 5 southbound. Photo taken by Chris Elbert (03/06/05). Continuing south, the succeding exits on I-5 link with Tualatin / Sherwood and Interstate 205 north. Photo taken by Chris Elbert (04/30/05). Three lanes advance south beyond I-205 toward Salem, Eugene, Medford, and California while two lanes lead northeast along the Portland bypass to West Linn and Oregon City. Photo taken by Chris Elbert (04/30/05). Traffic to I-205 north at Exit 288 leaves Interstate 5 south at the Sagert Street over crossing in Tualatin. Interstate 205 heads eastward six miles to West Linn and eight miles to Oregon City before turning north to Clackamas and east Portland. Photo taken 08/27/06. Exit 288 from I-5 south travels at grade level through the exchange with Interstate 205. Photo taken by Chris Elbert (03/06/05). Page updated October 4, 2018.